I have to tell you how thrilled we are with our Green Aracari, Olive. She is everything we’ve dreamed of in a pet bird: beautiful, quiet, funny and loving towards everyone. She was amazing from the minute we picked her up in the airport: she was chatting and eating on the way home in the car. After one day, she was all over us, playing in her cage, and acting like she’d lived here forever. She fits beautifully into our family of Collies and cats. She loves the dogs, and goes to the bottom of the cage when they come in the room so she can try and pull their long hair. She would do the same with the cats, but we don’t let them interact, for obvious reasons! Olive is about 95% paper trained – meaning she will leave the couch, chair, carpet area, etc. and fly to her open cage door and poop over the paper. We have been working on potty training her with positive reinforcement every time she poops on the paper, and so far it’s working. She is incredibly smart and seems to want to please us. She loves the water and takes a bath every day. She soaks herself in her water dish, then preens her gorgeous feathers. She loves to spend time in her cage, and is very good at entertaining herself. She is remarkably quiet. Her loudest noise is a chipmunk-like chatter that isn’t loud at all. We love her sounds – they are very sweet. So far, she loves all of our friends and family members, even our young niece and nephew, and will go to any of them in a minute. It’s wonderful to interact with a bird that really can’t bite you much at all. Her beak is too weak to do much more than exert pressure. It makes everyone feel comfortable, even people who have never had any exposure to birds, because they don’t have to worry about being hurt. She won over many of our friends the first time they all saw her, because she cuddled with them on the couch at bedtime. Our favorite thing about Olive is her incredible personality. She is so full of herself, and happy. One of her favorite games is to play peek-a-boo. 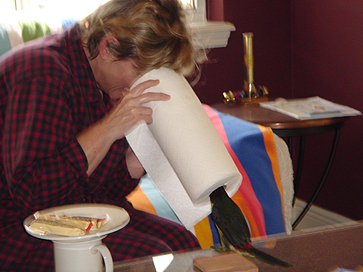 She sticks her head inside the paper towel roll to look at us on the other end. I’ve attached a picture of this. She loves to pull on my pajama pant drawstrings, so this has become a morning ritual. She sits on my shoulder, and likes to watch the cursor move around on the computer screen. Besides being adorable and funny, she is incredibly loving. During the day, she sometimes snuggles up with us, tucking herself tight against us, under our arms. It’s the sweetest thing ever. She purrs and coos and takes a nap. At night, when it’s bedtime, she always does this. It’s our nightly ritual. After she has sat with us for a while, she scoots off down the couch and goes in between the pillows to sleep for the night. She did that all on her own about the 2nd week she was here. We put a shirt over the pillows, so it’s cozy and dark in there. It’s hysterical! We have a bird that sleeps on the couch. I’ve attached a picture of her approaching her pillows (before we put the shirt over them). She actually lays down on the couch and sleeps! We can’t say enough about how much we love this bird. She is perfect for us: she doesn’t bond with one person, she is practically silent, and she has an incredible personality. Thank you, Emerald Forest, for breeding these gorgeous, adorable creatures and for making them available as pets. We love her to pieces!